When your everyday, run of the mill, bog-standard, throw it around the cinama, pop corn isn’t enough. 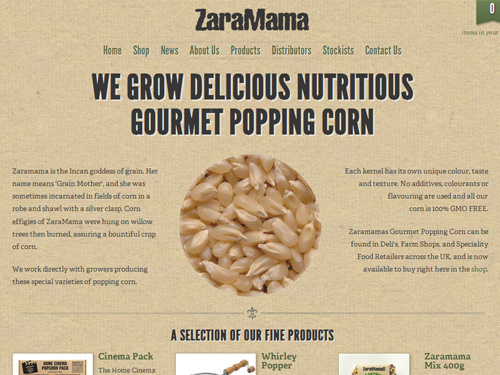 You need ZaraMama Gourmet pop corn! Not exactly sure how I would differentiate ‘Gourmet’ pop corn but the subtle detail in the this Shopify theme design is first class. It’s very organic and has a great, soft cardboard texture background, some nice fonts and interesting text effects.